The cost control process in a steel plant is a multivariate system which is subjected to a large number of inter- influencing variables affecting the cost performance of the steel plant. It is necessary to isolate the inter influence of the variables to understand the role played by the each variable on the cost performance of the steel plant. Major variables affecting the cost performance of a steel plant are discussed below. Productivity – It is the specific rate of production. Higher is the productivity of the units of a steel plant, lower will be the cost of production. Higher productivity results in better utilization of plant and machinery. Production – Production is the physical output from a unit. For good cost control, it is necessary that each unit of the steel plant should run to its maximum capacity. When production from a unit is lower than its capacity then there is an increase in the specific consumption levels. Also when any unit is underutilized then it will result into higher fixed cost (over heads, depreciation, interest etc.) per unit output. Further It is needed that the capacity of each succeeding unit should match with the preceding unit so that there is no under utilization of any unit. Raw materials – In the present day scenario, raw materials contribute to major cost of production. Hence specific consumption of the raw material should not be more than what is required by the technology employed. Any wastage of raw materials and their deterioration during storage should be totally avoided. Further raw material quality plays very important role in cost control. Lower quality raw materials though cheaper per ton results into higher consumption of not only of its own but also of other raw materials as well as higher consumption of fuel and energy. Hence there is a big effect on the cost of the product. Fuel – All metallurgical processes in a steel plant takes place at high temperatures and hence they are fuel intensive. Further cost of fuel is always on the increase. Hence specific consumption of the fuel should be controlled within the limits as needed by the employed technology. Further technologies upgradation in this area should be given priority so that specific consumption of the fuel can be reduced. Pay back periods of such upgradations will not be long hence capital expenditure should be carried out on such modifications without any hesitation. Energy – Besides fuel, there are other forms of energy that are used in a steel plant. Out of these, electrical energy has a substantial contribution to the cost of production. The quality of electrical power (power factor) is very important since it has a big contribution on the energy consumption and hence to the cost. To reduce electrical consumption there should be correct motor ratings. The idle running of the motors is also to be controlled. Further modifications are required to be carried out wherever feasible to switch over to hydraulic drives and variable frequency drive motors for reduction in specific power consumptions. Another area where usually large potential of power saving is available is in the area of lighting. Utilities – Under utilities comes oxygen gas, nitrogen gas, compressed air, steam and acetylene gas etc. This is the area where cost control steps can be very effective. Leakages of the utility gases in the air are usually ignored though they have considerable contribution to the cost of production. Manpower – In India, still there is an impression that the manpower cost is low and hence people normally go for labour intensive technologies since these technologies are normally low in capital costs. Plants constructed with such philosophies falls into trap of higher production costs after a lapse of time. Further higher dependence on human means more probability of errors and hence lesser reliability of the processes and equipment. Further in the labour intensive technologies, motivation of work force is very important for the output. Any drop in motivation means lower production and hence higher cost. Investments in automation level of the plant contribute a lot towards the cost reduction. Maintenance – If the timely and proper maintenance of plant and equipment is neglected then it amounts to breakdowns and unplanned disturbances of the processes. Process disturbance can cause either lower output or product quality fluctuations or both. This has big cost implications. Hence saving on maintenance is always counter-productive and should not be practiced if the aim is to reduce overall costs. Inventory – Inventory is a double edged sword as far as cost is concerned. Large inventories means blocked working capital and interest on this capital increases the cost. On the other hand if a process is to stop due to non availability of a raw material, intermediate product or a spare part then there is a process disturbance besides fall in production. This also increases the cost. So the inventory should be kept at the optimum level in order to reduce the cost implication either way. Technology – Technology is another area where maximum attention is needed if the cost of production is to be kept low. All those technologies which reduces consumption of raw materials, fuel, energy and utilities and improve the quality of products are to be selected for adoption even if they are having higher capital cost. The increase in the capital cost will be paid off in a short time but the advantages gained by lower consumption and improved product quality will remain for the life time of the plant. Recycling of waste – Most of the processes in a steel plant generates a large amount of solid (dust, sludge, scale, scrap and slag etc.) or liquid wastes. These wastes if recycled reduce the consumption of raw materials, fuel and water. Investments needed for recycling these waste materials has very low pay back periods. Hence for cost control these investments are to be made with priority. Recovery of waste energy – Recovery of waste energy has a major contribution in the cost reduction. Waste gases from the processes are usually at very high temperatures and contain a lot of energy in them. This energy can also be in the form of chemical energy. Letting out these waste gases in the air amounts to throwing valuables in a river. Recovery of these energies results into lower consumption of fuel and hence results not only into lower specific energy consumption but also results into lower emissions of CO2. 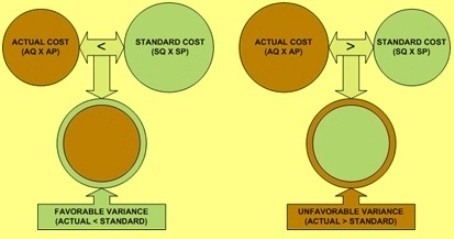 Cost sheets – Detailed cost sheets along with cost variance analysis (Fig 1) prepared based on scientific principles reflects accurately the areas where corrective actions are needed for effective cost control. Hence all the steel plants should have a system of preparation and distributions of detailed cost sheets for proper decision making regarding cost control. Product mix – Steel plants should have a product mix which should maximize its margins. Stress should be to reduce the production of intermediate saleable products and maximize production of finished products. Here comes the importance of forward integration. Further production of value added products need to be optimized since in integrated steel plants these products can be produced with a marginal additional cost. Process and quality controls – Effective process and cost controls are very essential for the cost management of a steel plant. Effective process and quality controls reduce production of rejects, seconds and diverted materials to lower grades and hence aids in cost management. Pollution control measures – In steel plants, there is thinking that pollution control equipment are a burden on cost since they need power and consumables to operate. But this thinking is not based on the hard facts. Pollution control equipment recovers a large amount of dust, sludge and scale etc. which when recycled back save a large amount of raw materials. Without the pollution control measures not only these materials get lost permanently but also heavy pollution of the environment takes place. Safety – Safe working of the processes and equipments aids to the cost management. The unsafe working can cause process disturbances, equipment breakdowns and injuries to the operators. This in turn means loss of production and increase in the costs. Further any injuries to the working persons bring down the morale and efficiency of the work force which again results into production loss. Sir, lot of thanks for this valuable article. Sir, slag is a waste or should it be considered as a salable byproduct? Slag is a waste material which should be recycled but Slags can be converted into saleable product after processing. Example is granulated BF slag. sir, what are the uses of granulated bf slag??? there are many uses of granulated slag but the major use is in the manufacture of BF slag cement.